In a saucepan, cover the sweet potatoes with water, add salt and bring to a boil. Cover and simmer until tender, about 30 minutes; let cool slightly. Meanwhile, in a small saucepan, simmer the apple cider over moderately high heat until reduced to 1/2 cup, about 20 minutes. Peel the sweet potatoes and puree them in a food processor. Transfer 3 1/3 cups of the puree to a large bowl. Lightly beat in the flour and egg yolks and season with salt and pepper. Spoon the dough into a pastry bag fitted with a 1/2-inch round tip. Working in 3 batches over a large saucepan of simmering water, pipe out the dough, cutting it into 3/4-inch lengths. Cook the gnocchi for 45 seconds. 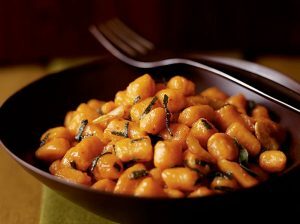 Using a slotted spoon, transfer the gnocchi to a baking sheet. In each of 2 large skillets, melt 1 tablespoon of the butter. Add half the gnocchi to each and cook over moderate heat until golden, about 2 minutes. Add the garlic and sage and cook for 1 minute. Stir in the reduced cider and serve.